published on November 7, 2016byAuthor admin Comments Off on What is the Best Type of Flooring for an Office? With so many choices in office flooring, deciding upon the one most suitable for your requirements can seem quite daunting. 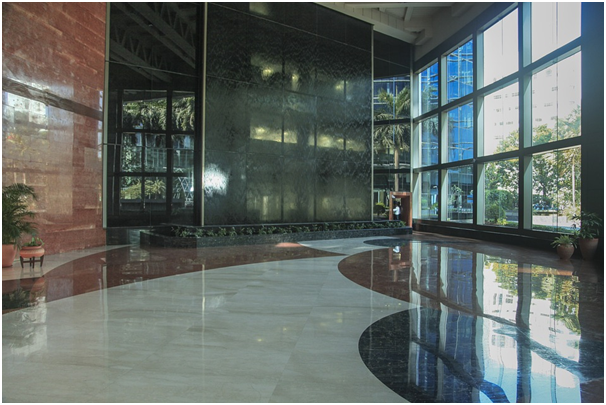 You need to take into consideration the amount of foot traffic your floor will be subjected to, how it fits in with the overall design of the office, its durability and your budget. The most popular choice was traditionally low-pile carpet, which creates a warm working environment and reduces the sound of footsteps and moving furniture. Choose a carpet with a pattern to help hide scuff marks and stains. Don’t be tempted to purchase a cheaper product, as it will be a false saving. Inferior quality carpet will wear out more quickly and need replacing. If you are worried about spillage or staining, opt for carpet tiles which are easily replaced at a fraction of the cost of replacing an entire carpet. They have the added advantage of being flexible when creating a design on your floor. Make sure any carpeting complies with fire safety regulations. Most products are sourced from sustainable material but nothing is more natural than harvesting bark from living cork trees. A major advantage of cork flooring is that it absorbs sound. It is also resilient to heavy-duty use and retains its warm appeal. If you are only familiar with corks that come out of a wine bottle don’t be disheartened. Cork comes in many colours so you will find something which perfectly suits your requirements. Timber floors make an immediate impact on visitors but they are not practical for some offices. They are not the best solution if you want to reduce the noise of people walking about and they also require a lot of tender loving care to keep them looking at their best. Easier to maintain and keep looking pristine, yet giving an authentic polished look, is laminate flooring. It is robust and cost-effective, and there are many options to choose from. You can find a wide variety of examples with suppliers such as ukflooringdirect.co.uk. Alternatively, vinyl flooring is available in a range of attractive colours and styles which can be used to enhance your office space. This is a viable choice if you want to keep your cleaning overheads to a minimum but take into account the floor’s slip resistance.